Scaffolding systems are really popular among construction site tools. They are regarded as the most effective and safest way to get a job accomplished to a high-quality level. You will almost always see a scaffolding system present at a jobsite and they are widely used for doing various remodeling projects as well. Why are Scaffolding Systems Important? Scaffolding systems are used for projects that need to be completed that are high up in the air. They are temporary structures that are used for creating a place for a worker to set up their work area at different heights. It’s important to use these systems so that workers can have the tools that they need readily available at their disposal. When choosing the best scaffolding system for you, it’s important to consider what type of system that you will need. There are different types of scaffolding system. Single Scaffolding system more commonly known as a bricklayer’s scaffolding because they are commonly used for brick masonry when building houses or other buildings. This type is made up of standards, put logs, and ledgers which are fixed to the ground in rows parallel to the building at a distance of 1.2 meters. There are usually about two to three meters between each standard and they are tied with a rope lashing to the ledgers at every rise, which is about 1.2 meters to 1.5 meters. The putlogs are position in a way that they get support from the ledgers. One end is fixed to holes within the wall and are positioned between 1.2 to 1.5 meters apart. Double Scaffolding is more commonly called Mason’s scaffolding because they are used for stone masonry. Two rows of stands are put into the ground to make the scaffold stable since the putlogs cannot be fixed to the stone wall. The first row is about 20-30 centimeters away from the wall and the other row is about 1.5 meters away from the first row. The putlogs are then supported at both ends by frames. Cross braces and raking shores are provided on these scaffolds to prevent any slipping and to make the system stronger. This is also known as independent scaffolding because it’s completely separated from the wall. Cantilever Scaffolding are scaffolding systems that are used when it is impossible to secure the stands to the ground. These systems have to be clear of any traffic to be used. One could also use this system for construction work on the top of a tall skyscraper. The standards are placed at certain heights above the ground and they are placed on a platform with needles that extend out of the holes in the wall. The inner ends of the needles are strutted to stop the needle moving upwards. The other ends are held by inclined strut and held together with dogs. Suspended Scaffolding involves suspending the system from the roof of tall buildings. This requires you to adjust the level by raising and lowering the working platform itself. They are used when it is impossible to create a work base. They are used for exterior repairs from home improvement and simple projects like cleaning windows and painting. 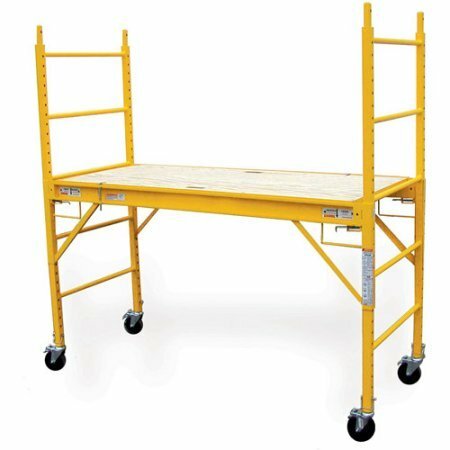 Trestle Scaffolding, also known as rolling scaffolding, is used when you need to move your workspace from one place to the other. The wheels are locked to prevent movement when there is a person on the platform. This is optimal for interior home improvement construction like painting, repairs, and plastering ceilings. Patented Scaffolding are made of steel, making them extremely durable and sturdy. They are ready-made and can easily be purchased for immediate use. They are working platforms that are placed on brackets so you can adjust the height of the system. There are several other factors that are important to consider when choosing which scaffolding system to purchase. The height of the scaffolding is a really big factor to consider, especially if you have a project that is really high above the ground. The load Capacity is another factor. You will need a high load capacity to ensure that the person and all necessary materials are able to be on the system at the same time. Another factor would be the overall quality of the system. Usually steel scaffolding systems are the easiest ones to set up, move, and adjust if needed. They are more durable and sturdy than others on the market. Cost is also a big determining factor. It’s important to consider your budget for your project, since it’s a huge investment. Whilie there are many different scaffolding systems on the market to choose from, here are some of the more popular ones on the market today. This scaffolding system by CBMscaffold is a really great option for those who are looking for a system to use for drywall. The scaffolding system is 5’W x 7’L x 10’11H and has a load capacity of about 800 pounds for each wheel. The tower comes with guard rail posts, guard rails, and gooser to ensure that they are working safety. The system includes three aluminum plywood hook deck walk boards. There are also aluminum walk boards available as well, depending on your need. There are four single box scaffold frames that are made with a durable powder coat finish. The system includes four heavy duty rubber caster wheels the double brakes with bearings that can be greased. The wheels are about eight inches. The cross braces are galvanized, as well as the guard rails and there are four of each included. There is one galvanized finished diagonal gooser, four galvanized finished snap pins, and eight galvanized gravity lock pins. The Titan scaffolding system is a great option for projects inside and outside. It’s designed to be able to handle everyday usage around many different construction site. This system includes three single units, two ends, two trusses, one plank, and four casters. The system is 30 in. W x 18 ft. H x 6 ft. L. This makes it perfect for projects that are high off the ground. The load capacity is 1000 pounds which means that a person plus all work materials will definitely be able to fit on the system at the same time, making the job go quickly and easily. This multi-purpose ladder made by OxGord is a really useful tool to have when working around the house. This ladder has a maximum load capacity of 350 pounds and is made from durable aluminum. This helps the ladder resist rusting and corrosion. The ladder is lightweight and can easily be moved around from one area of the job site to another. 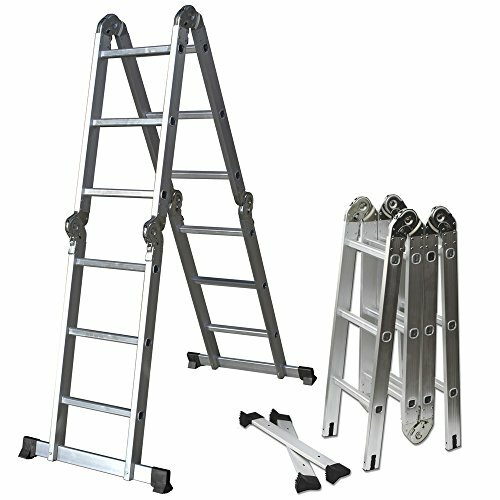 This ladder is a multi-fold ladder, which means that the ladder can be manipulated several different ways to accommodate for tight areas on the job site. The ladder is very affordable, which is perfect for those who are on a tight budget, but still have projects that they need to accomplish. 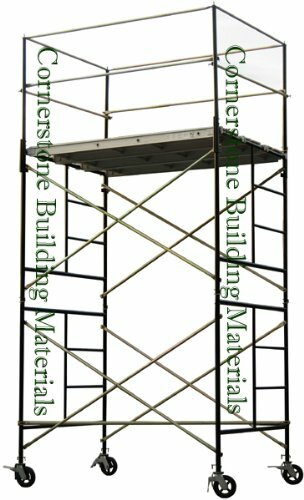 The Metaltech Saferstack scaffolding system has frame stacks that are in 30 percent less space than regular space. This helps the user to be more efficient when moving from one area to another while on the job site. The frames have an interlocking mechanism that offers a safer way to store and transport the system. This helps aide in the prevention of the stack frames from sliding. The frames are durable, and they have long lasting blue anti-slip textured powder coating. This provides a superior grip and secure footing when the user is climbing up to the top of the scaffold. The pin spacing in the system is four feet, which is the industry’s standard that’s compatible with most other scaffolding systems as well. The tower is two sections high with guard rails included. The rugged frame ensures safety and security with aluminum platforms that are 5/8 inches. A thick plywood deck makes for a slip-resistant surface for walking. The total tower load capacity is around 3,000 pounds and meets OSHA standards. This makes the Saferstack a wonderful choice for a professional construction job site. 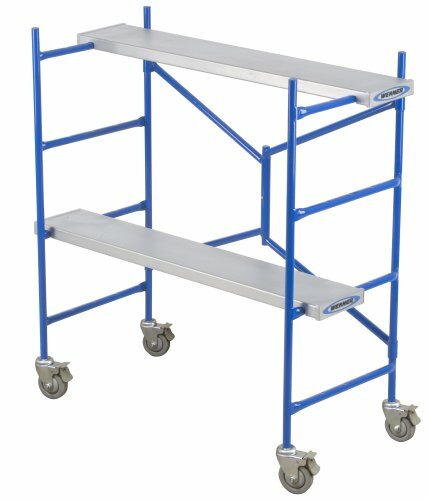 This scaffolding system from Pro-Series features a metal platform. This scaffold is six feet tall and comes complete with four five-inch locking swivel casters. This system would be a great option for both interior and exterior projects, as it is all steel and very durable. The scaffold also includes a powder coated paint finish. The steel frame has a half an inch thick wooden deck and is strong enough for a person and their building materials. This system assembles and comes apart so easily that it only takes a single person to complete the job. This system has a 1,000 pound load capacity and is 29 inches wide. The frame fits through standard doorways, providing a variety of usage for this scaffolding system. This scaffolding system is in compliance with OSHA and ANSI scaffolding regulations as well. The Metaltech scaffold is specifically designed to assist with interior projects. This system includes a foldaway concept and can be stored incredibly easy. When it is folded, the scaffold folds down so flat that it can easily be placed in the backseat of a car or the bed of a truck easily. This system has a 500 pound load capacity, which is much smaller than others on the market. This is why it is only designed for interior usage. This scaffold should be used for a one person job due to the load capacity. The height of the scaffold will allow you to add about an extra four feet to help you be able to do any high interior projects such as painting your ceiling. This system is one of the more affordable one the market as well. This scaffolding system will definitely get you in the mood to start some projects around your house! The Werner PS48 is a scaffolding system that would also be a wonderful choice for interior jobs, however, this system can also withstand the outside elements as well. This system is very versatile and has a load capacity of 500 pounds. 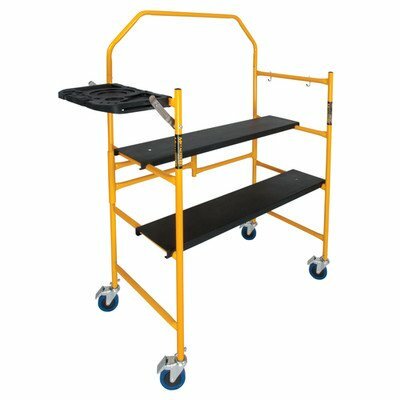 This system can be used as a portable workbench or just a shelf to hold all of your work materials. This system comes equipped with smooth, gliding wheels that make it easier to get the heavy materials from one area to another very quickly and easily. This system is lightweight and can be put together by just one person. 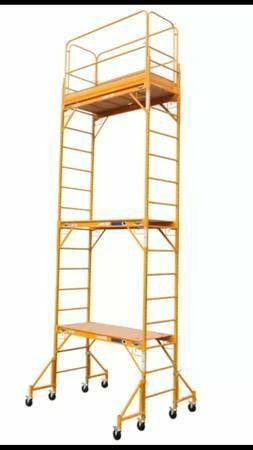 This scaffold folds up compactly and can be stored in a garage or closet very easily as well. The wheels are high-grade and can be locked for extra safety and to prevent scratching any precious flooring. This scaffolding system can be adjusted to multiple working levels, a great way to get to hard to reach places. This also helps keep your materials organized so you can grab the right tool at the right moment. Werner scaffolds and ladders are known for being extremely durable and will last a long time. This is a great, affordable option if you are looking to purchase one for your next interior or exterior project. The Pro-Series two story scaffold is designed for interior usage only. This helps even the tallest projects in your house or commercial work area get completed quickly and easily. This scaffolding system would be a wonderful choice for the handyman working around the house or a professional contractor on a commercial property. This system can be used for a variety of projects, such as patching, painting, drywall, wallpapering, and even doing electrical work. 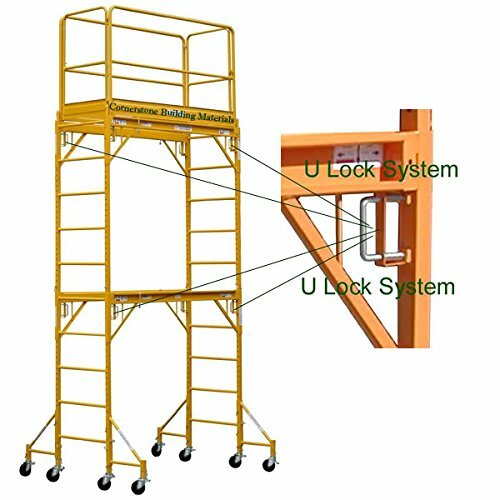 This scaffolding system can also be used either as a single stack or a double stack, which is really helpful and makes it a breeze to switch between jobs easily. The load capacity is 1000 pounds and has a half an inch thick wood deck with a steel frame. The system will hold two bigger workers plus all of their work materials as well, which is a huge plus. The scaffold is easily assembled and also very easy to take apart for really convenient storage. The overall size of the scaffold is 6 ft. L x 4 ft. 5.25 inches W x 14’10” H. This scaffolding system has a wide wood work surface and a wood/steel platform that sits up to 11 feet above the ground. The scaffolding system comes equipped with a durable powder coat paint finish and a 1.5 inch tubular steel construction. This scaffolding system meets all of OSHA and ANSI scaffolding regulations. Overall, these eight choices for scaffolding systems are some of the best choices on the market. They make many different projects much easier, like putting up drywall, painting, electrical work, working on ceiling molding, and many other things. Scaffolding systems provide a really safe and easy way to get your project accomplished, either around the house or in a commercial setting. Check out these scaffolding systems for yourself to determine if one of these scaffolds may be the perfect option for you.